Fern Canyon was donated by the Pacific Lumber Company to the State to add 2,125 acres to Prairie Creek State Park. A hiking trail follows the canyon and creek. The start of Fern Canyon Trail is reached at the bottom of the canyon by hiking a quarter mile north up California Coastal Trail from Fern Canyon Day Use Area, which is north of Gold Bluffs Beach Campground. The trail loop is 0.5 miles, one end of the trail connecting to the James Irvine Trail. The prehistoric ambience led to the canyon being used as a filming location for The Lost World: Jurassic Park, BBC's Walking with Dinosaurs and IMAX's Dinosaurs Alive!. 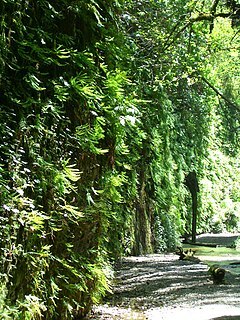 Moss cascades down the side of Fern Canyon where water trickles over the edge. ^ Turner, Dennis W. & Gloria H. (2010). Place Names of Humboldt County. Orangeville, CA: Dennis W. & Gloria H. Turner. p. 92. ISBN 978-0-9629617-2-4. ^ "Fern Canyon Trail in Prairie Creek Redwoods State Park". hikespeak.com. hikespeak. Retrieved 2017-01-14. ^ "Filming Locations for The Lost World: Jurassic Park". The Worldwide Guide to Movie Locations. Retrieved 2007-06-30. This page was last edited on 9 September 2018, at 19:09 (UTC).